I participated in an Influencer Activation on behalf of Influence Central for King’s Hawaiian. I received product samples as well as a promotional item to thank me for my participation. Are you ready for some football?! 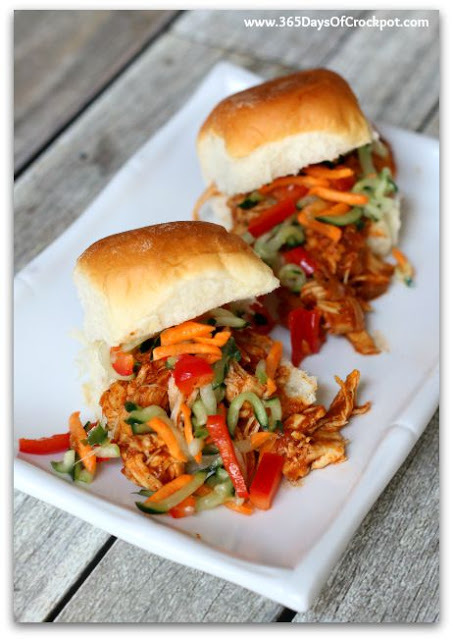 These simple to make and delicious to eat pulled chicken sliders with a crispy fresh cucumber slaw are perfect for your game day party. It’s been a rough month in the Petersen household. Greg, my husband, is having major withdrawals from football. It’s been 207 days since the super bowl and he simply CANNOT WAIT for football to start next Thursday (Michigan vs. Utah). Oh man, he just LOVES his football. He is like a kid on Christmas starting on September Saturday mornings. It’s like he can’t even sleep he’s so excited. We are major Ohio State Buckeye fans in our household and last year was just like a dream for him when they won the undisputed national championship. We’re hoping for good things again this year. Now, I must say that I actually really like college football too. And part of the fun of football is, of course, the food. I love the chips and dips and wings and really all of it! This year I’m stepping out of the box just a bit and bringing these delicious sliders to the table (er…couch) for game days. And you can bet that these babies will be gone before halftime (maybe even the first quarter). 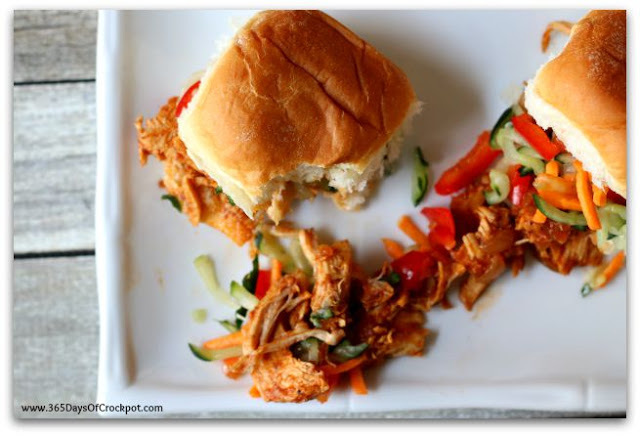 One of the cool things about these pulled chicken sliders is that they taste incredibly fresh. I love the bright cucumber, carrot, pepper slaw that’s served on top of the chicken. And if you haven’t tried King’s Hawaiian buns you really need to. They are probably the best store bought rolls that I’ve ever tried. I love the original Hawaiian sweet rolls (you could also go for the savory butter or the honey wheat). They are soft and fluffy and actually quite addicting. 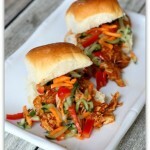 I love the slight sweetness in these rolls to pair with the chicken and slaw. And if you’re a hot dog/hamburger type of person you can buy the King’s Hawaiian hot dog buns and hamburger buns and they have the same fluffy, sweet, irresistible taste as the original rolls…holla! (Which I can guarantee are 100 times better than regular hot dog buns). I love that King’s Hawaiian is a family owned company that’s been making premium baking products for 60 years now. You can find the full company history here. Look for the orange packages in your deli/bakery section of your grocery store. Greg loved these sliders (almost as much as he loves football). So I think you’ll like them too. Give them a try for your next game day party (or just for a weekday dinner). Place the chicken in the bottom of the slow cooker and liberally salt and pepper it. In a microwave safe bowl, combine the diced onion, tomato paste, chili powder, paprika, red pepper flakes and 2 tsp of olive oil. Microwave on high for about 5 minutes, stirring every 90 seconds. Add in the ketchup and molasses. Stir. Add mixture into the slow cooker. Cover and cook on LOW for about 4-6 hours. Chicken should be very tender and shreddable. Remove the chicken and shred on a cutting board. Add in the apple cider vinegar and the Dijon mustard. Stir. Add in the shredded chicken. Stir to coat. Grate the cucumber into nice, long shreds. Place grated cucumber into a colander and stir in the 1 tsp of salt. Let it drain of liquids for about 30 minutes (I was surprised at how much liquid drained out). Grate the carrot. Dice the red pepper. Add the cucumber into a bowl with the carrot and red pepper and toss in the olive oil. 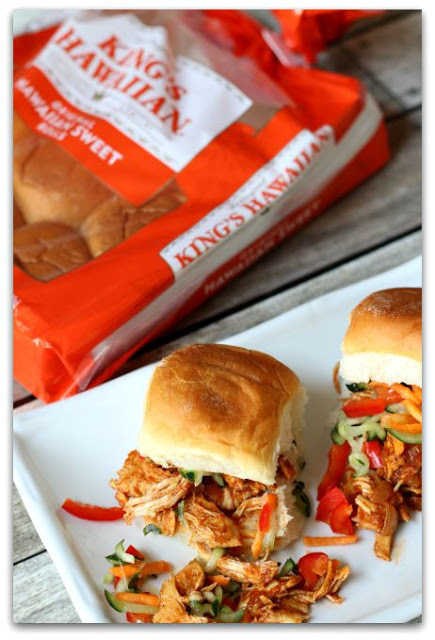 Portion out the chicken onto each of the King’s Hawaiian rolls. Then portion out the slaw onto each of the rolls. Serve immediately and enjoy! I agree with "Unknown". These have become a hit in my family. I also skip the microwave step. The slow cooker does the job just as well and saves me some steps, and dishes. Thanks for sharing this recipe! I made these and they have become a favorite in my house. I skip the microwave direction. Works just as well. Delicious! Okay glad to know that skipping the microwave worked! I'm always up for less time in the kitchen. I do love those Hawaiian buns Karen, and so does my husband Jon. We have some very excited football fans at our house too. These will be perfect for game day!!! !